The GUE Primer course is a two day workshop, focusing on buoyancy control, balance, stability, trim & propulsion (kicking) techniques. Great for those seeking to improve their overall control in the water. 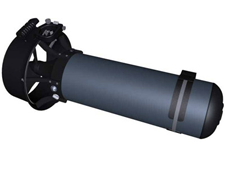 A great class for new and experienced divers & photographers. 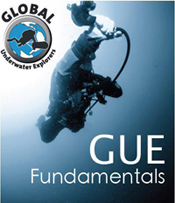 The GUE Doubles Diver course is a two day workshop, preparing you for diving a double tanks configuration. 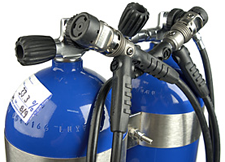 Emphasis is placed on proper buoyancy and trim, valve drills, the 9 associated failures, recognition, problem resolution and team diving. Learn the proper techniques for drysuit diving. 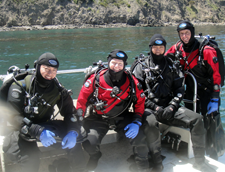 The GUE Drysuit course prepares you for controlling buoyancy, trim, stability and control while diving your drysuit in a standard GUE equipment configuration. 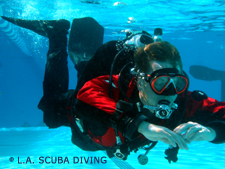 Course is two days, with academics and pool training followed by ocean dives to complete the course requirements. GUE Fundamentals in the beautiful clear waters of Catalina Island. Learn More Here.